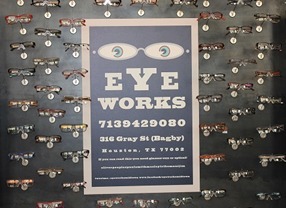 Eyeworks at Midtown started in 2001 by Dr. Hien Tran. She saw a need in the eyecare industry for eyewear that made people feel good about their glasses. Dr. Tran loved eyewear but saw that not many patients felt the same way about their own eyeglasses. At Eyeworks all the frames are carefully hand selected for quality and for great style. Eyeworks wants you to be unique so we strive to carry exclusive lines that are only found at a handful of opticals around town. We also pride ourselves in helping our customer find the right frame that suits their personalty and their face. At Eyeworks we don't have a problem finding the right frame for you. Our problem is selecting only one out of the vast amount of choices in eyewear.